Specializing in the beautiful music of Ireland, Scotland and all the Celtic countries. Something different, but also elegant and inspiring. Classical or pop can be added to the mix as well. 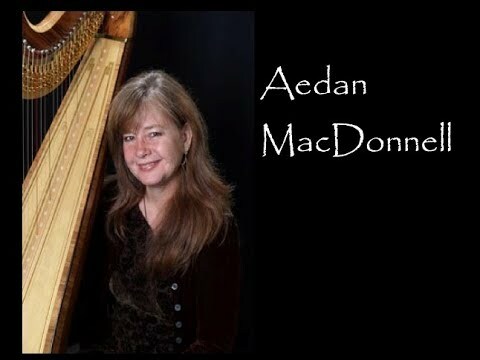 Performing for 25+ years, Aedan MacDonnell has studied Celtic harp and Celtic music in Ireland, as well as with master harpists from Scotland, Wales and the U.S. You'll love working with her and your guests will be impressed with the beauty her music brings to every event. Aeden did a fabulous job of playing incidental music for my father’s reception. This is the second time we were able to have her play and we feel fortunate to have had her both times! Music was beautiful and it made the ceremony really memorable. Thank you! Harp muse is an appropriate name for Aedan. She magically transformed our Burns Dinner from a party to an event that our friends and family will remember forever! She could not have been more helpful and gung-ho for whatever was thrown her way. She played musical accompaniment for 2 singers she had never met learned a new song and gave a fabulous and fun performance - even singing herself! Aedan joined our Ferguson Clan and friends and made the Bard proud. Music was beautiful, calming and relaxing. are happy that we were able to hire her! Very professional! Thank you! It was a beautiful reception, and lovely meeting both you and Bea. 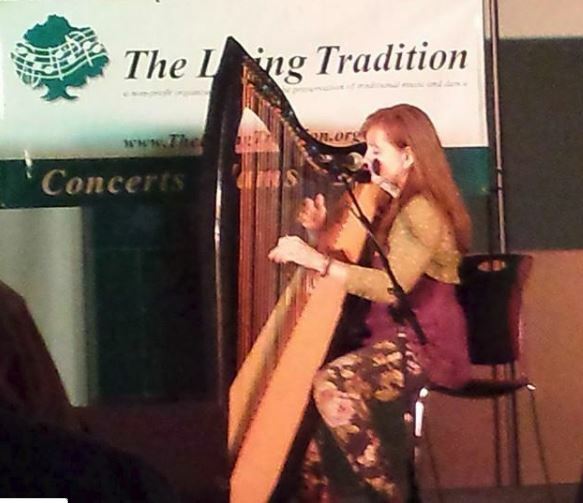 Harp muse was a fantastic addition to our holiday party! Aedan's music and personality were a perfect addition to our event. I recommend her highly. The harp not only provides beautiful music, but there is also the visual side of a performance. Aedan dresses appropriately for the occasion, be it elegant, casual or themed. She plays the Celtic harp, which sounds just as gorgeous as the concert harp, and is also visually beautiful, standing almost 5' tall with a striking ebony finish. Aedan can provide a state-of-the art sound system if needed, or a smaller, but powerful, battery-operated amplifier for outdoor events. Always on time and professional, you will love working with Aedan. She does everything she can to accommodate you and your guests to help make the music portion of your event a success. 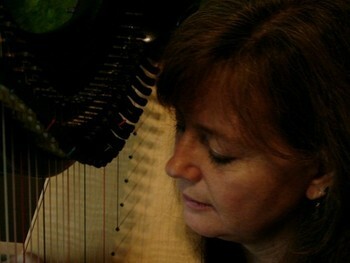 Aedan is an award-winning harpist, singer and multi-instrumentalist. Over the past 30 years she has performed in Southern California and the San Francisco Bay Area for radio shows, public television, music festivals, benefits, art shows, restaurants, hotels, private parties, weddings, funerals and religious celebrations. Aedan has recorded for "Outlander" and "American Princess," and is the harp coach for "The Big Bang Theory." She has also appeared as a guest harpist on several CD's, She currently plays harp with several groups in the Los Angeles area. Set up is quite easy. A small 5' x 5' area on dry, flat ground is required. If outdoors, shade is also required. Aedan has her own sound system, or she can plug into an existing system. Aedan brings her own equipment.